David Hunt Lighting Euston single light ceiling fitting shines new light on the ever popular industrial trend that is brightening up kitchens, bars and cafe's across the nation! 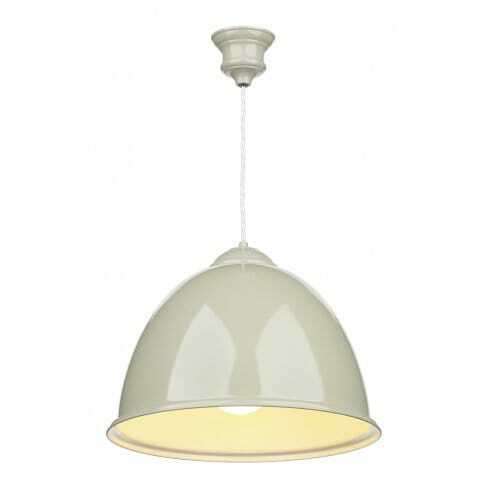 The product code for this David Hunt ceiling pendant is EUS012. It features a sleek, domed pendant with a vintage-inspired french cream finish that can be wiped clean for easy maintenance. The white interior bounces light for brilliant illumination and the cream braided cord allows for harmonisation with most modern decors. Looks especially great when used in co-ordination with shabby-chic or country cottage style themes. Height is adjustable at the time of installation and is double insulated. This British made range is available in a large selection of finishes including white with green, pink or blue interiors, polished chrome with clear, black or red cable, and a variety of vintage themed pendants in shades of blue, cream and green. Mix and match these items to suit your home and your tastes!